Raging Spirits is a fun looping roller coaster at Tokyo Disney Sea. A much smoother and comfortable clone of Walt Disney Studios' Indiana Jones et le Temple du Péril, this roller coaster looks fairly average during the day. But at night, it transforms into a beautifully and dramatically lit temple. 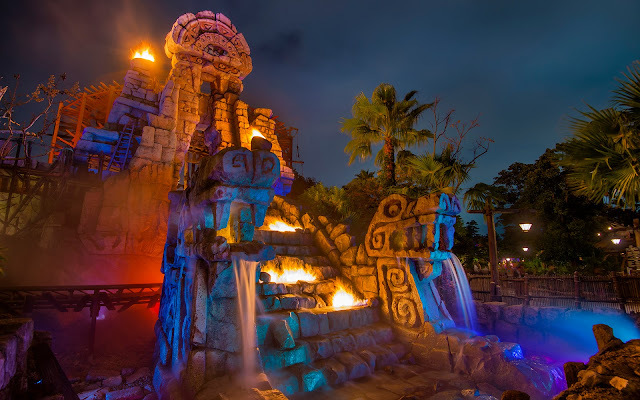 The steps under which the coaster track careens by are illuminated in a warm blaze, while cool purples, blues, and aquas wash the magnificent stone carvings. It all makes for a sight that is both spectacular and a little eerie. But it's a fantastic setting no matter which way you view it! The temple at Raging Spirits is lit aflame at night.